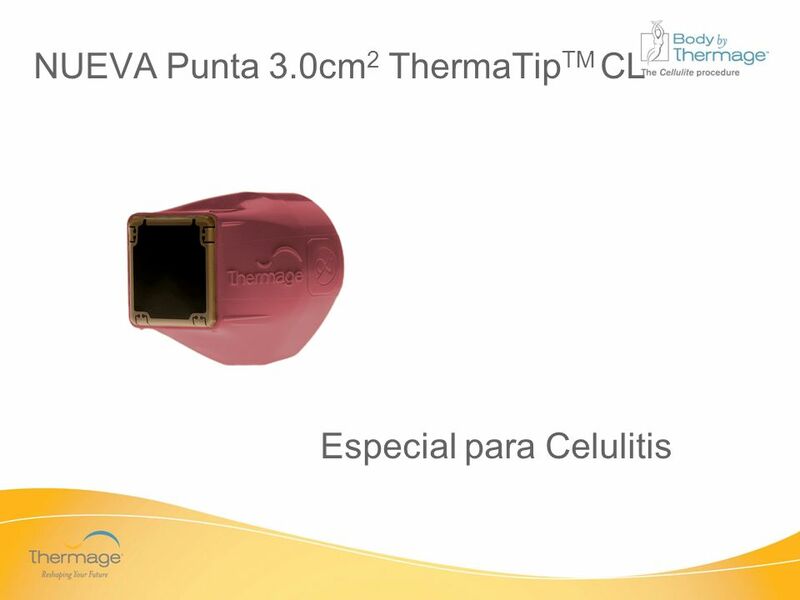 Punta de 3.0cm2 ThermaTipTM CL We will begin by reviewing what cellulite is and its cause. 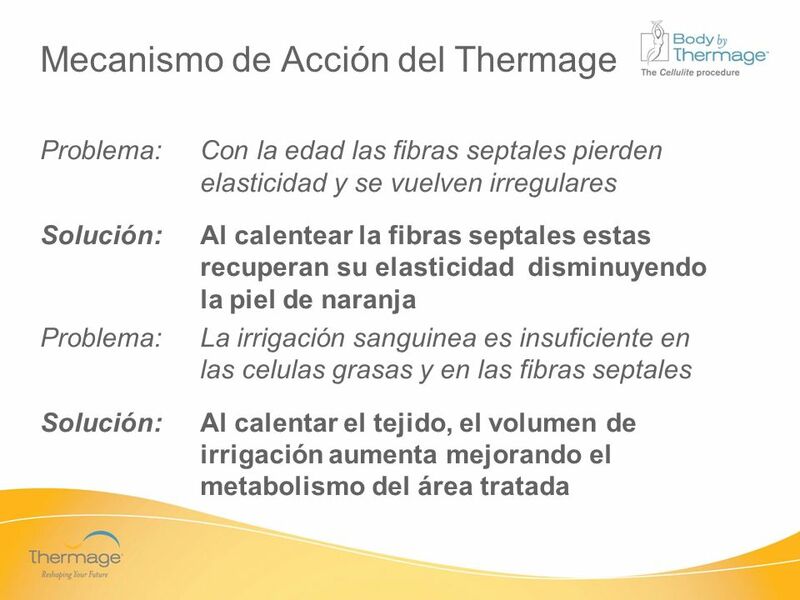 We will discuss market demand and Thermage’s mechanism of action for treating cellulite. 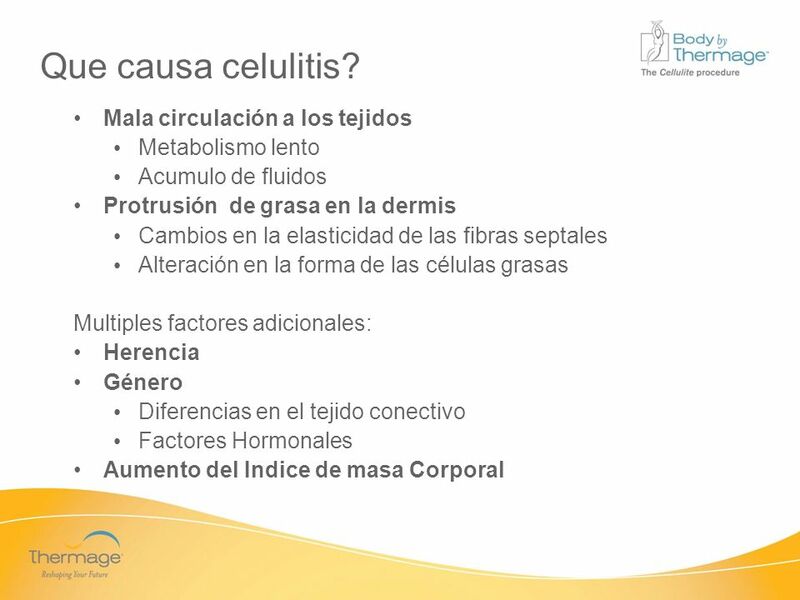 2 Que es la celulitis? Alteración topográfica de la piel comunmente descrita como “Piel de naranja” o “Piel de colchón” Protrución de células grasas a través de la Dermis, que produce una superficie irregular Típicamente ocurre en áreas donde hay acúmulo de grasa, predominantemente en las mujeres Cellulite is often described as having an appearance like an orange peel or a mattress. Fat cells are visible through the skin layers and become uneven. Cellulite is typically seen on the thigh and buttock regions of women. Acumulo de fluidos Protrusión de grasa en la dermis Cambios en la elasticidad de las fibras septales Alteración en la forma de las células grasas Multiples factores adicionales: Herencia Género Diferencias en el tejido conectivo Factores Hormonales Aumento del Indice de masa Corporal Read first two bullets Cellulite occurs most often in post pubescent females and can be driven by hereditary factors, as well as increased body mass. Problema: Con la edad las fibras septales pierden elasticidad y se vuelven irregulares Solución:	Al calentear la fibras septales estas recuperan su elasticidad disminuyendo la piel de naranja Problema: La irrigación sanguinea es insuficiente en las celulas grasas y en las fibras septales Solución: Al calentar el tejido, el volumen de irrigación aumenta mejorando el metabolismo del área tratada Thermage addresses two problems that cause cellulite. 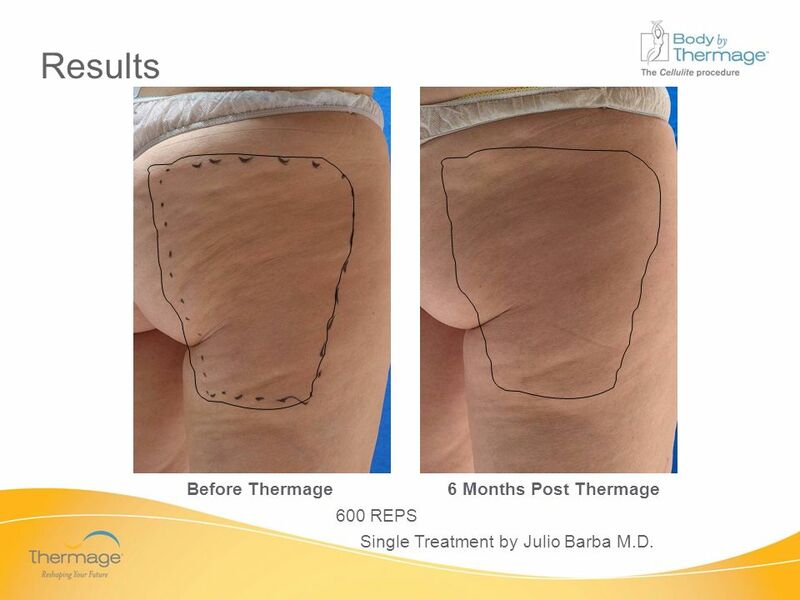 Thermage uses radio frequency energy to deep heat collagen which improves connective tissues and increases circulation to cellulite prone areas. This animation demonstrates what occurs during and after the Thermage cellulite treatment. 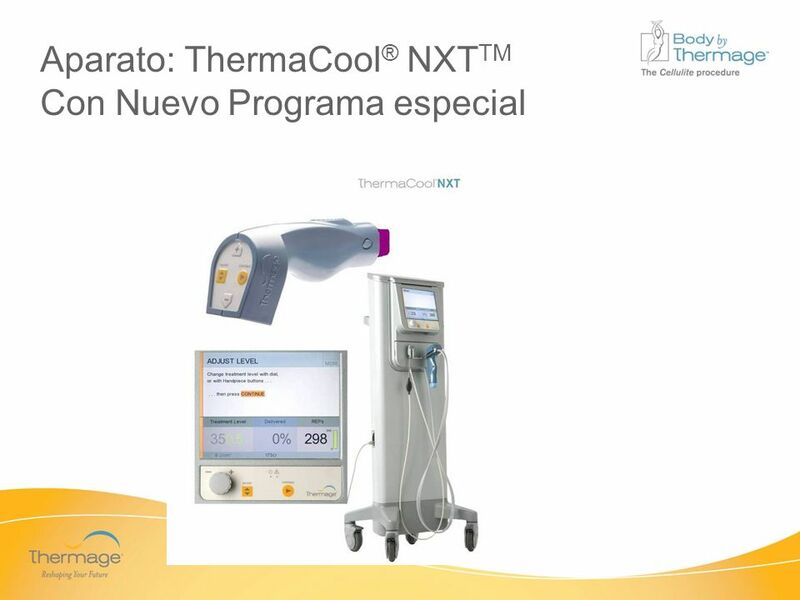 If you are a NXT user you must first upload software version or higher before the ThermaTip CL can be utilized. The TC-3 systems do not require software upgrades. 9 Single Treatment by Silvia Cuevas, M.D. Results This patient had an excellent result that according to her doctor has lasted beyond these 6 month photographs. Before Thermage Months Post Thermage	14 Months Post Thermage 1000 REPS Single Treatment by Silvia Cuevas, M.D. 10 Single Treatment by Silvia Cuevas, M.D. Results Here is another great result in early studies. Before Thermage Months Post Thermage Months Post Thermage 1000 REPS Single Treatment by Silvia Cuevas, M.D. 11 Single Treatment by Silvia Cuevas, M.D. Results And yet another great result. All these patients maintained their weight within 5 pounds of there pre-treatment weight. Before Thermage Months Post Thermage Months Post Thermage 1000 REPS Single Treatment by Silvia Cuevas, M.D. 12 Single Treatment by Silvia Cuevas, M.D. Results Before Thermage Months Post Thermage Months Post Thermage 1000 REPS Single Treatment by Silvia Cuevas, M.D. 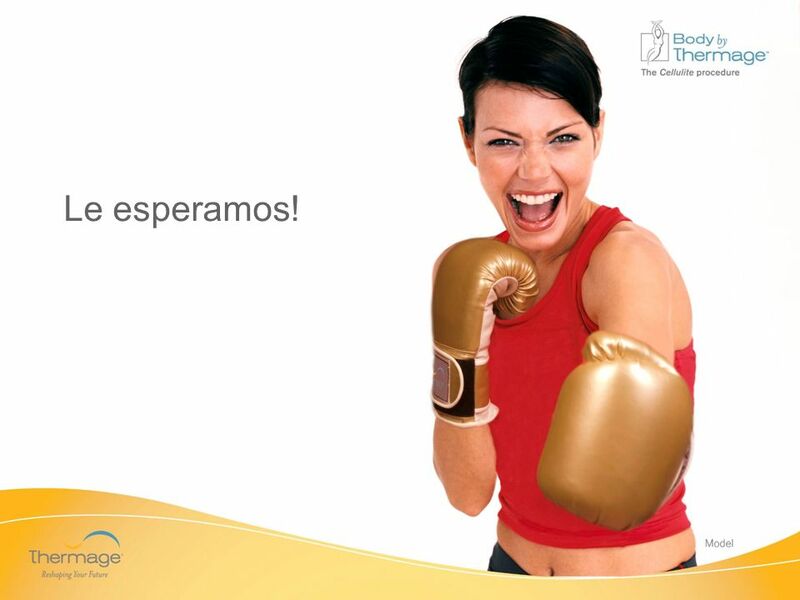 Results These are patient photos from clinical studies performed in Mexico. Here the treated area is flatter and smoother. Before Thermage Months Post Thermage 600 REPS Single Treatment by Julio Barba M.D. Results At six months post treatment this patient shows smoothing in the treated areas. Before Thermage Months Post Thermage 600 REPS Single Treatment by Julio Barba M.D. 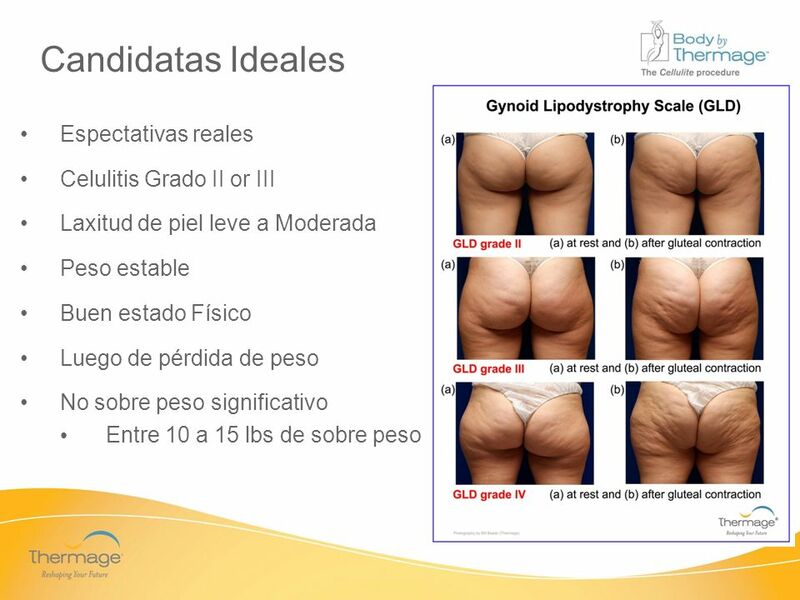 Laxitud de piel leve a Moderada Peso estable Buen estado Físico Luego de pérdida de peso No sobre peso significativo Entre 10 a 15 lbs de sobre peso Thermage provides the GLD scale on the right to clinicians wanting to evaluate appropriate candidates for the procedure. Ideal candidates for the cellulite procedure have grade II or III cellulite. Patients with grade IV cellulite are not usually good candidates and may not be happy with the outcome. As with all Thermage procedures, the proper expectations are key. 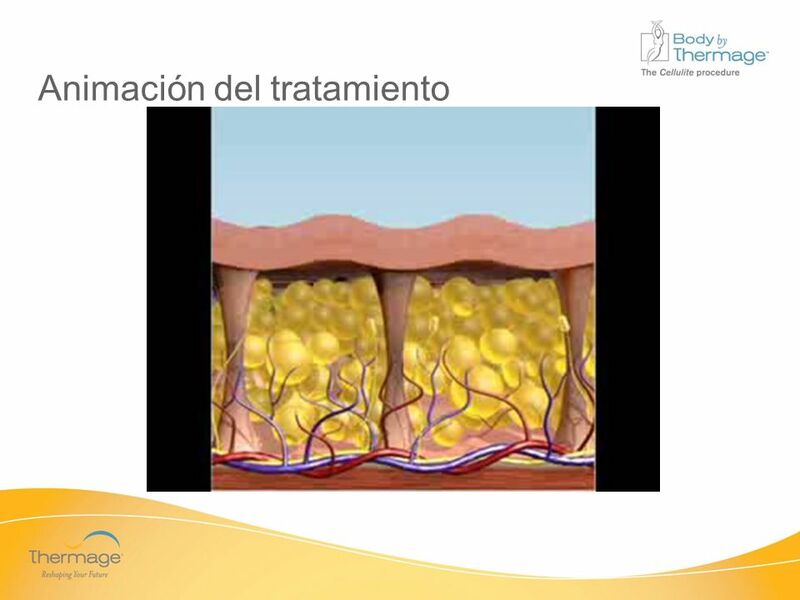 Grade classifications: Grade I: no visible cellulite Grade II: After skin contraction or compression there is pallor, decreased temperature and decreased elasticity. Grade III: Padded skin &/or orange peel appearance at rest; palpable sensation of thin granulations in the deep levels; pain to palpation; decreased elasticity; pallor and decreased temperature. Grade IV: Same as III with more palpable, visible and painful nodules, adherence to the deep levels and an obvious wavy appearance of the skin surface. Descargar ppt "COMBATA LA CELULITIS EN UN SOLO ROUND"